Why do compass needles point north—but not quite north? What guides the migration of birds, whales, and fish across the world’s oceans? How is Earth able to sustain life under an onslaught of solar wind and cosmic radiation? For centuries, the world’s great scientists have grappled with these questions, all rooted in the same phenomenon—Earth’s magnetism. Over 2,000 years after the invention of the compass, Einstein called the source of Earth’s magnetic field one of greatest unsolved mysteries of physics. Here, for the first time, is the complete history of the quest to understand Earth’s magnetism—from the ancient Greeks’ fascination with lodestone, to the geological discovery that the North Pole has not always been in the North—and to the astonishing modern conclusions that finally revealed the true source. 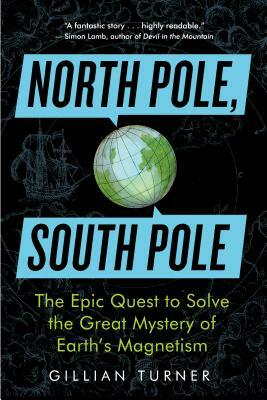 Richly illustrated and skillfully told, North Pole, South Pole unfolds the human story behind the science: that of the inquisitive, persevering, and often dissenting thinkers who unlocked the secrets at our planet’s core. Gillian Turner is a senior lecturer in physics and geophysics at Victoria University in Wellington, New Zealand. The winner of numerous awards for excellence in teaching and science communication, Turner has published over fifty articles in scientific journals. This is her first book. "By deftly combining threads from science and history, Turner weaves a fascinating geophysical tale that spans several millennia." "She has provided a concise and interesting history of the study of magnetism, and a fascinating new perspective on one of the most important geological discoveries of the twentieth century. . . It's well worth a look!" "North Pole, South Pole is a comprehensive account of one of the great forces that shapes our planet and its future."